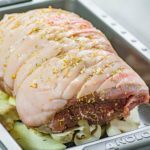 Roast Leg of Pork - Keto "Sunday Dinner" Recipe - With Perfect Crackling! Home » Recipes » Roast Leg of Pork – Keto “Sunday Dinner” Recipe – With Perfect Crackling! Not quite sure how to Roast a Leg of Pork, we’ve put together this recipe to help you create a succulent Sunday dinner that’s ideal for your Keto diet due to the high-fat meat. The crackling on this delicious Leg of Pork comes out perfectly. The rule of thumb when roasting a leg of pork is to cook it for 30 minutes per pound. The initial high-temperature cooking is to turn the skin into the perfect crackling which of course is just perfect for keto. We blended the pork leg’s cooking juices with the onion, mushrooms, garlic, and fennel seed to make a great flavorsome gravy-like sauce. This sauce is included in the nutritional information. 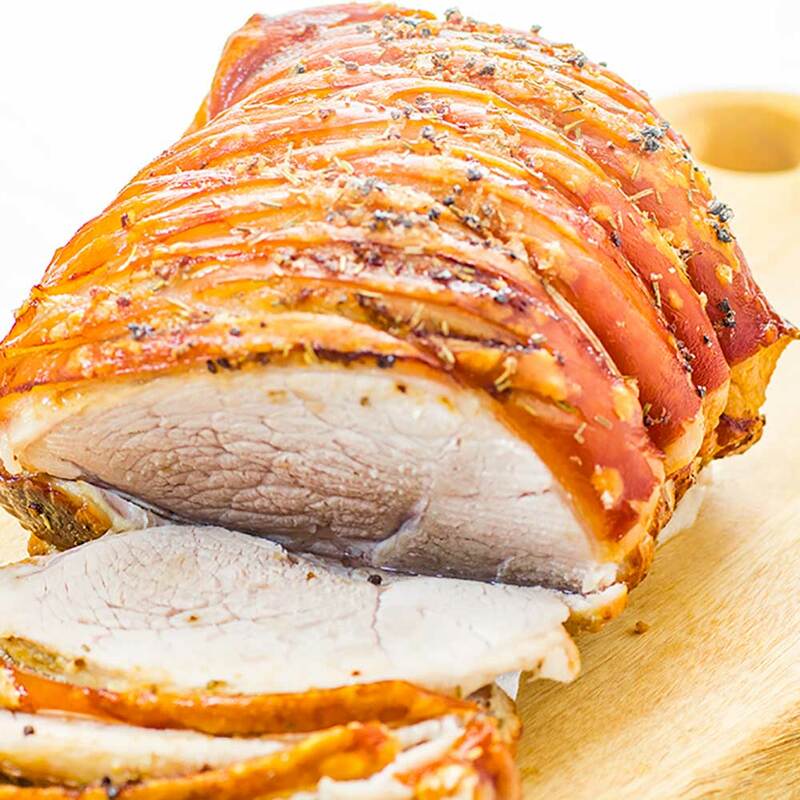 Our roast pork recipe makes 12 serves, allowing approximately 5 ounces per serve. Serve your roast leg of pork with our Buttery Cauliflower Mash, Followed by our very Keto Christmas Low Carb Eggnog Cheesecakes recipes. Rinse the pork leg and pat dry with paper towel. Rub the pork leg with the salt, rosemary, granulated garlic and olive oil. 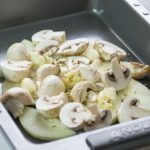 Slice the onion and mushrooms into thick slices and line the base of your roasting dish. Sprinkle over the whole garlic cloves and fennel seeds. Place the pork on top of the onion, mushrooms, garlic and fennel seeds. Place into the oven. Roast for 40 minutes (or until Crackling is to your liking, keep an eye on your leg of pork after around 30 mins) at 220C/430F then turn the oven down to 180C/355F and roast for a further 1 hour and 20 minutes. Remove from the oven and slice to serve. Roast leg of pork is easy to make and keep on hand in the refrigerator, its the perfect fatty meat for a low-carb keto diet. Not quite sure how to Roast a Leg of Pork, we've put together this recipe to help you create a succulent pork leg roast that will fit into your Ketogenic Diet. The crackling on this delicious Leg of Pork comes out just perfect. Roast for 40 minutes, then turn the oven down to 180C/355F and roast for a further 1 hour and 20 minutes. 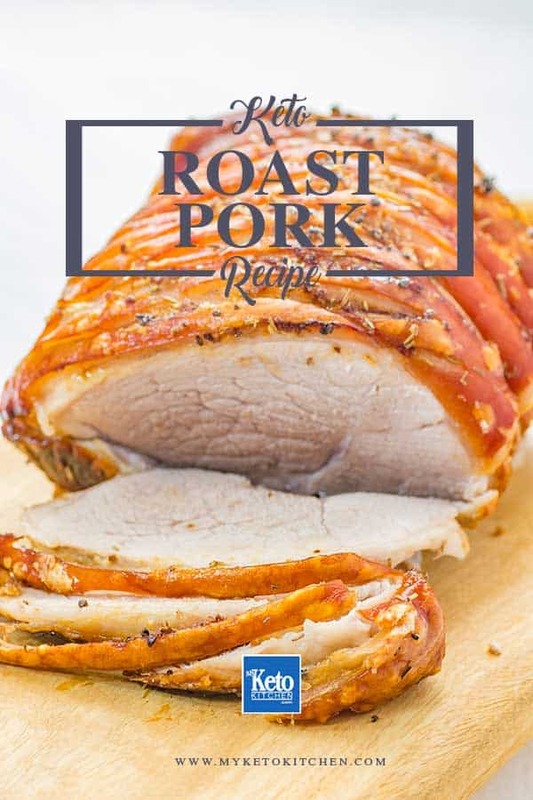 If you want to Roast a Leg of Pork that is larger or smaller, simply adjust the serving amounts in our easy to use recipe card above.